South Korea’s top search portal operator Naver Corp. said on Thursday its technology research arm Naver Labs has agreed to develop a 5G-enabled service robot in partnership with the country’s leading telecommunications company KT Corp. and U.S. tech giant Intel Corp. 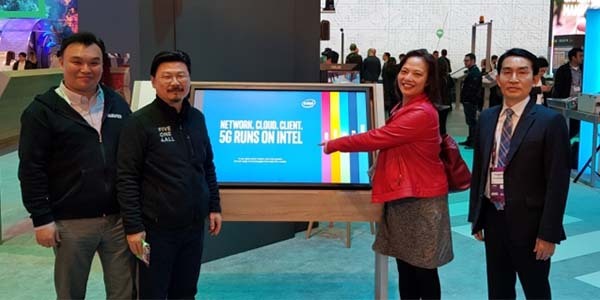 The partnership agreed at the MWC 2019 in Barcelona will allow Naver Labs to leverage Intel’s 5G and computing solution, as well as sensors in the development of the robot. The project will also be joined by Naver’s subsidiary NBP, which supports the entire IT infrastructure, including the cloud, Internet data center (IDC) services, and security. NBP`s Naver cloud platform will serve as the brain of a robot, making the robot body smaller and lighter. KT will connect the robot and the Edge Cloud infrastructure with its 5G network, providing a basis for the service robot to send and receive data in real-time, ultra-low latency. Naver will continue to cooperate with participating companies to materialize scenarios and develop solutions. KT showcased 5G-enabled robotic helpers for room-service deliveries at hotels during the same show. “The commercialization of 5G technology will create new business opportunities and smart factories and service robots will be such examples,” said Kwon Myeong-sook, president of Intel Korea. "We look forward to leading the global industry by combining KT’s 5G commercial network, the Edge Cloud infrastructure, and advanced technologies from Naver and Intel," said Lee Yong-Gyoo, head of KT’s 5G Business Unit. 3S. Korea’s exports in April likely to extend losing streak for 5 strai..